Here at Spencer Weddings and Entertainment, I’m honored that you have chosen me to represent you as Master of Ceremonies. Sure, I’m a trained professional, but public speaking is still among the top fears of people everywhere. 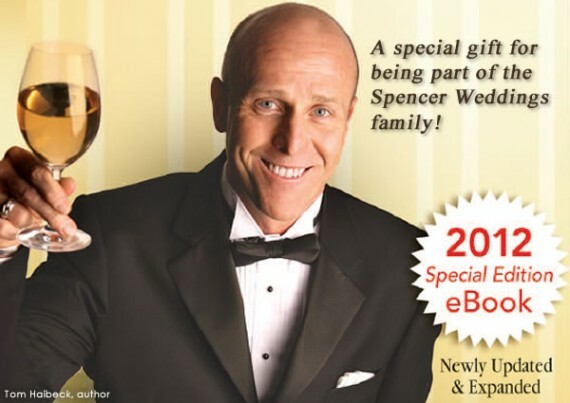 That’s why I want to offer you and your wedding party – anyone giving a toast at your wedding – the best selling book Wedding Toasts Made Easy – absolutely FREE! This book is recommended by Regis Philbin, who even used the book to prepare for his own daughter’s wedding and featured it on his show. It’s full of great great advice to help you research, write, rehearse and deliver a fabulous personalized wedding toast. Simply click the button below, and you’ll get your copy of the book. When you try to open it, you’ll notice that it is password protected. That’s because this offer is only available to wedding couples that are using my services. Please refer to your email for the password, or contact me directly if you can’t locate it. This offer is limited to wedding couples working with Spencer Weddings and Entertainment. Clients are allowed to provide up to four (4) copies of the book to their wedding party or family members that will be giving toasts. If you’d like to reserve Jason for your wedding celebration, be sure to fill out the request information form.